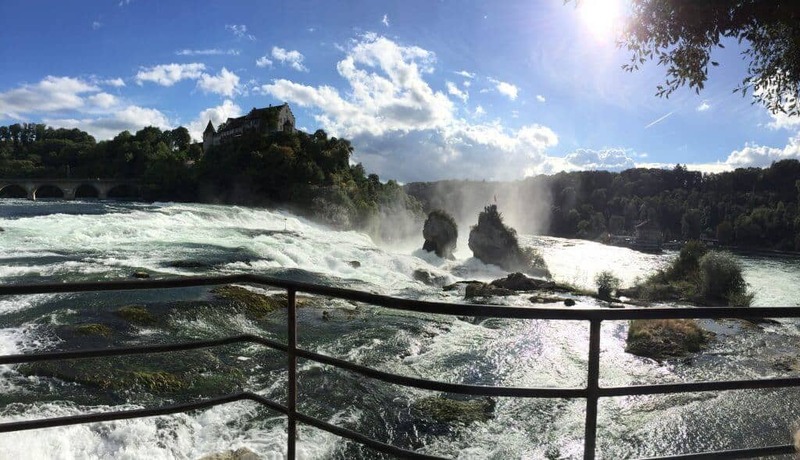 Rhine Falls is one of the most beautiful places to visit in Switzerland. It is also the largest waterfall in all of Europe, making a top destination to visit. There are multiple vantage points to enjoy the views of not only of Rhine Falls but also Schloss Laufen. Rhine Falls is located in the Northern region of Switzerland, near the border of Germany. It is located at Rheinfallquai, 8212 Neuhausen am Rheinfall, Switzerland. We drove from Stuttgart, Germany so we relied on their paid parking areas. There are multiple parking lots (located on both the northern or southern banks) depending on which direction you arrive from, just follow the signs. Parking is 5 Swiss Francs for the first hour and then 2 Swiss Francs for every hour after. We prefer the parking lots on the Southern Bank due to their proximity to the falls. If you park in the Northern lots, you’ll have a bit of a walk around to the Falls, or you can pay for a boat ride to the southern bank in order to view the Falls from there. You can also reach the fall via train or bus. 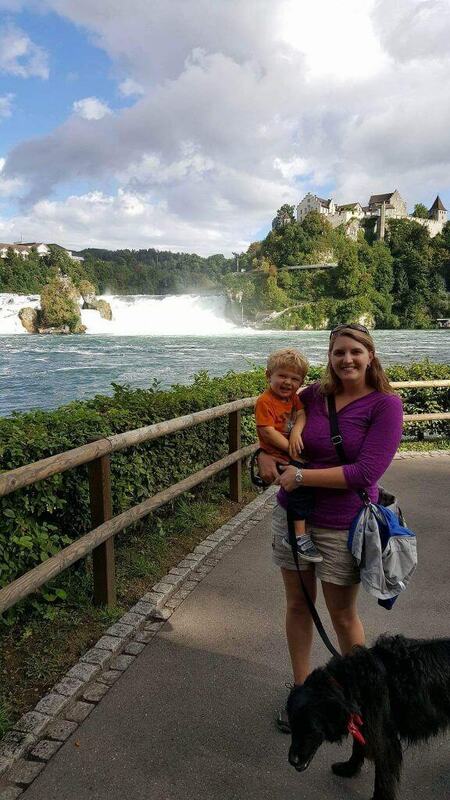 See the Rhine Falls website for detailed information. 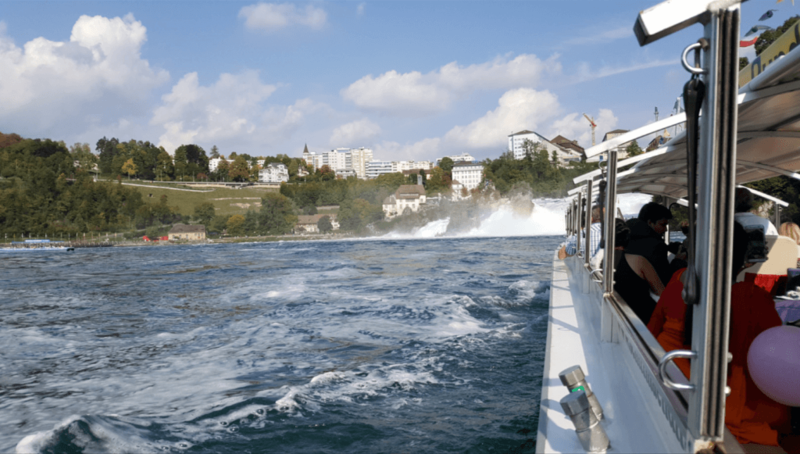 View Rhine Falls: One of the best parts about Rhine Falls is that it is free to view the Falls. There is no cost to enter (minus the parking fees). Enjoy viewing the falls from all the various platforms on the southern bank before heading up the stairs (on the left) to view the Falls up close, see the waterwheel house and continue across the railroad bridge if you want to continue your trek. Boat Rides: There are two options for boat rides. One is a short (15 minute) round-trip boat ride up to the Falls and back. The second option is another round trip boat ride but includes a stop by the rocks to climb the rock in the center of the Falls. You’ll purchase your tickets at the small ticket window down by the southern bank. Prices vary from 7 Swiss Francs per adult (shorter boat ride) up to 20 Swiss Francs per adult (longer boat ride with rock climb). Night Time Attractions: Check out the Rhine Falls website to see their night events including light illuminations and fireworks! 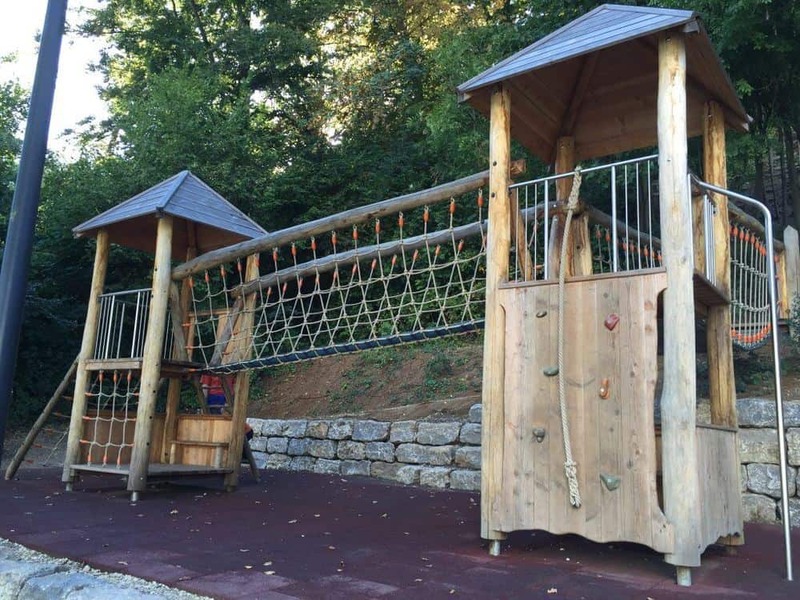 Things to do with Kids: Be sure to check out the amazing playground located on the Southern Bank with a view of Rhine Falls in the distance. 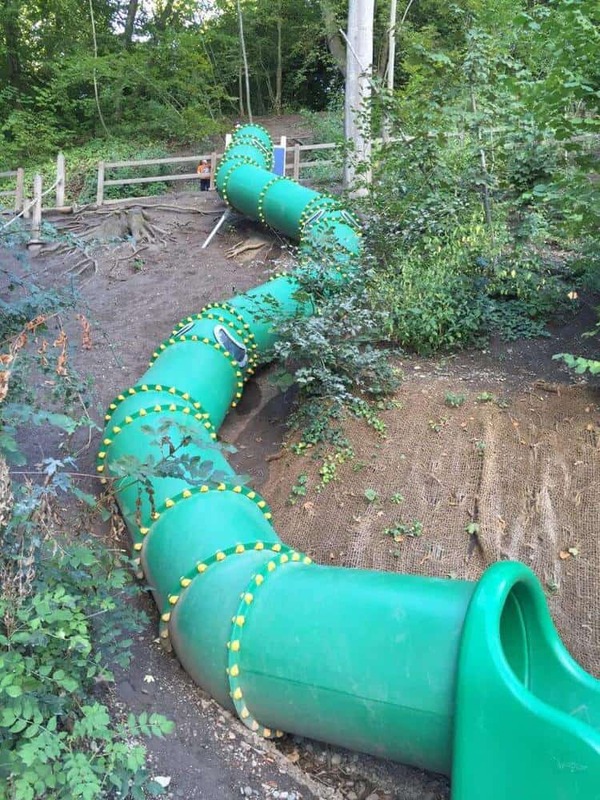 It features multiple climbing zones, a huge winding slide down the hill and rocks to clamber over. We also enjoy the popcorn machines, insert a coin and watch the popcorn cup fill. Restaurant Options: There are many options from full-service restaurants to cafe’s and buffet style eateries. -The grounds are dog-friendly, so feel free to bring along your pup. Just ask before you enter a restaurant and they aren’t allowed on the boats. 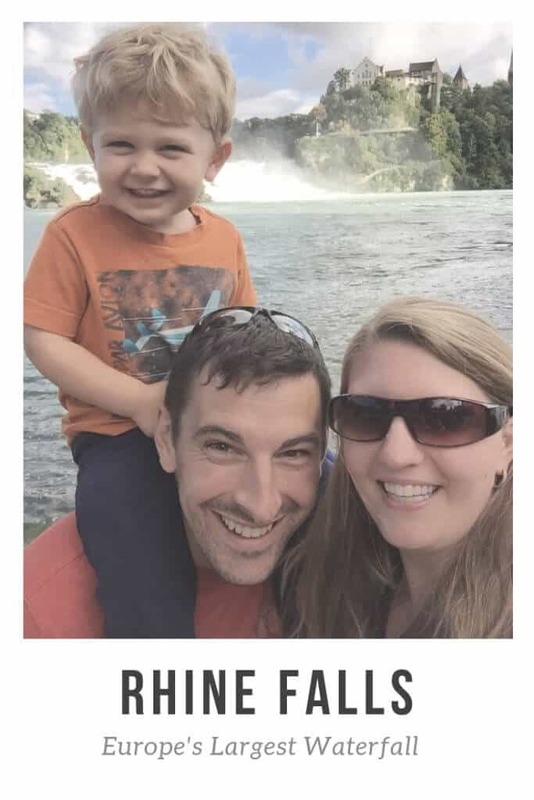 -The lower grounds are stroller friendly, but as you head up the left side to view the Falls up close, you’ll encounter stairs. It is possible to take a farther left path that ventures up a hill (without stairs). -You’ll have a better exchange rate with Swiss Francs, even though most vendors will accept Euros. There are ATMs to get some local currency. 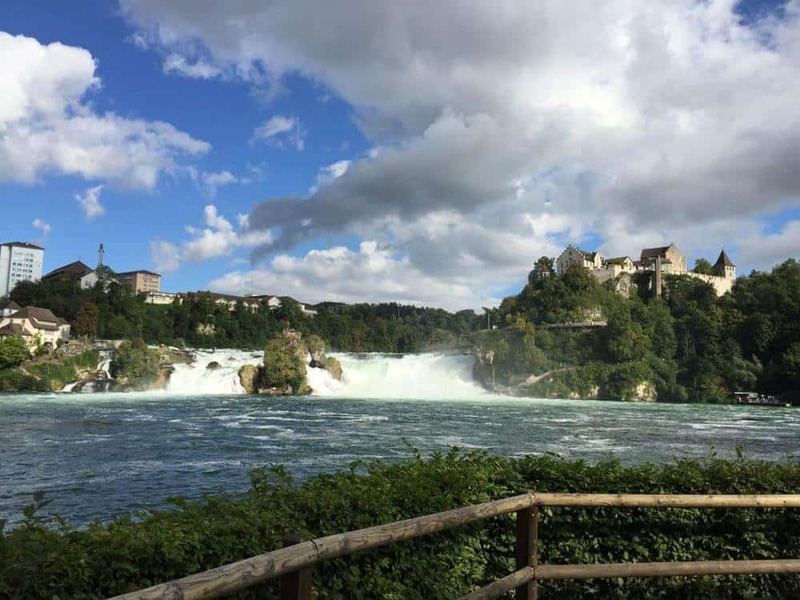 Plan a trip to Rhine Falls and then head back to the Grindelwald, Switzerland post to see what other waterfalls you can discover! Or perhaps you’re ready to plan another adventure, head to our destinations page to view the interactive map. We’ve also just added a huge guide to Europe with Kids, tons of great information!